Frame No. 30-596 / 51506. Some time around 1964, I found this outfit tucked away in a corner of a wrecker’s yard run by one Joe Vial in Blackburn, Melbourne, Australia. The bike was covered with the bonnet of a Standard ‘Vanguard’ and numerous waterlogged potato bags. It appeared that Joe’s brother had cleared out his garage and the outfit had been dumped in the yard – probably because it was closer than the tip. When found, the Norton was fitted with a narrow 1930’s-period racing sidecar, rather like a ballet shoe in contour. The sidecar is built up on the ‘cut & shut’ frame of a lightweight Goulding touring ‘chair’. The most notable things about the bike on casual inspection (apart from extensive surface rust) were the crankcase, rather roughly cast in bronze (! ), and the faded legend “Norton 596” painted on the sidecar nose. When, on discovering it, I asked Joe about the bike, he described it as an ‘Oily Manx’. He claimed that it was essentially a prototype that later evolved into the single OHC ‘International’ sports machine and the twin-cam ‘Manx’ of racing fame through the 1950’s, 60’s etc. The crankcase had no identification nor could any frame number be found. Joe said that he and his brother had raced it in Victoria, mainly fitted with the side-car, prior to World War Two. It had ‘blown up’ in 1939 and had been re-built. It was being run-in when WWII broke out and it was not used again. Its claim to fame, according to Joe, was that it held the record for the long defunct Whittlesea hill climb. Although I had never heard of a ‘596’ Norton, I was a great admirer of the cammy Nortons in general and I coveted the machine from the outset. However, being in the ‘impoverished student’ category, I couldn’t afford the £50 Joe demanded for it. I went around to the yard from time to time for car parts and checked up on it whenever I was there. The price went down to £45 after a time, but that didn’t really help me much. Finally, during one visit Joe told me, with a sort of disillusioned moroseness, that one night, a week or so before, someone had tried to steal the bike. They had dragged it to the corrugated iron fence of the yard, but apparently found it too heavy to lift over. The evil-doers (or at least evil-attempters) then tried to take off the carburettor and magneto. 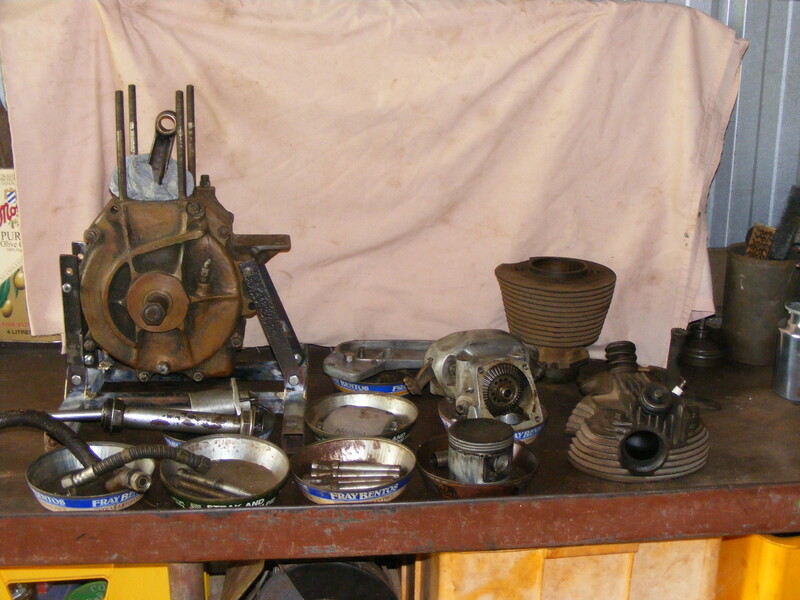 Fortunately, as both are rare period racing items (a BTH racing magneto and an Amal twin float chamber carburettor), they could not get them off with the pair of pliers and screwdriver which seemed to be their only tools. All that was actually stolen was the fuel lines and magneto chain cover (bastards!). Now this episode thoroughly scared me, and I immediately came to the conclusion that the Norton was actually more desirable than having three meals a day for an indeterminate stretch of the future, so I bought it for £45. It came with a box containing a set of engine shaft sprockets and a selection of alcohol jets of sewer pipe dimensions for the carburettor, together with a spare cylinder, a high compression piston and a few other odds & ends. In order to get it from the wreckers yard to where I lived four or five miles across town, I enlisted the help of an understanding student friend who owned a car to tow me on the equipage. (I believe that he may not have appreciated what a performance this would prove to be.) Being towed through Melbourne suburban Saturday afternoon traffic on a sidecar outfit with only one grabbing brake and the chair hovering in mid-air on its dirt-track camber was something of a defining experience in my life – it brought home a profound conviction of my own mortality. According to Joe a rough Roneoed factory information booklet, with tuning and gear ratio recommendations, etc. was around somewhere; he thought his brother still had it. At that stage I was leaving Melbourne for a couple of months, so I arranged to pick up the manual from Joe on my return and hopefully get more detail on the bike’s history. When I went around to the yard next, not only was the manual not there, but the whole yard had disappeared and a housing estate was going up. Despite detective work I never located Joe or his brother. Various explanations have been offered for the bronze/brass crankcase, but no definite explanation has emerged – It may have been part of the 1939 rebuild, but looks far more weathered than short running-in sessions would explain. Presumably the extra strength of bronze over aluminium justified the awe-inspiring weight of the unit. The frame seems to be heavier gauge than a standard Norton 500 and there is a shallow hump in the top tube to clear (barely) the top of the engine. The bike has very low ground clearance, as if it were designed specifically for side-car use. Comparing the quotes above indicates that there is a distressing degree of vagueness among the scholars as to the details of the machine. Judging from some of these photographs, my machine may be the rigid frame ‘596’ raced by Bruce Rehn of Adelaide earlier in its life, but there seem to be various differences among the illustrations. In Dec 2010 exhortations from the UK prompted me to look for a number on the spare cylinder barrel that came with the Norton. A number 56859 was discovered on the base flange. Also a serious cleaning exercise conducted on the frame by a friend – a task somewhat akin to archaeology, which he hates – brought the number – 30-596 / 51506 -to light beneath several strata of paint and Castrol R on the engine mounting lug on the frame down-tube. The machine was despatched from the Norton factory on 15/10/1933, making it (due to Norton’s odd dating system) a 1934 model. The original engine number corresponds to the number on the ‘spare’ cylinder barrel and the numbers cited for the forks and the magneto correspond to my machine. Intriguingly, the gearbox number is recorded as 9892, while the number on the existing gearbox is 7892. The extensive welding stripes on this gearbox case may explain the fate of the original box. The name ‘Tozer’ leads one to speculate that Harold Tozer, the UK sidecar rider may have had some involvement, but so far nothing to support this has come to light. ‘Adel’ seems most likely to mean Adelaide and the Adelaide Advertiser of 8 March 1934 records Bruce Rehn setting over thirty Australian and South Australian speed records at Sellick’s Beach on a “598 Norton”. Moreover, The Melbourne Argus, of Tuesday 29 January 1935 lists Rehn as winning the Australian Sidecar TT at Phillip Island – by two miles out of fifty- on a “590 Norton” outfit. one kilo solo flying- start, two way. South Australian Class up to 600 c.c. 102.85. So there are still gaps to be filled in and further research is in order; but allowing that motor sport journalists were unlikely to be more precise then in recording fine technical details (such as the precise number of cc’s of the engine) than they are now, I am cherishing the hope that my ‘Big Banger’ is in fact the rather heroic Rehn machine referred to. It would appear that the 596 must have had positively orgasmic power, to apparently tear up one crankcase and two gearboxes during its racing career, so it will be most interesting to have it running again, even using it with the respect due to its great age and many infirmities – qualities it shares with its owner. The 596 engine is now dismantled and ready for cleaning and repairs. The photographs below show the general results. Unfortunately, the engine (and the entire bike, for that matter) has been very poorly maintained in the past. Many screws and nuts & bolts have been substituted with the wrong threads, and will have to be replaced. During the dismantling I had to spend most of my time making up special spanners to cope with some very odd fasteners. I have acquired a good number of BSC and BSF bolts and screws which should overcome most of the difficulties, but there will still be some tedious filling ad tapping-out of holes to be done. The frame, mudguards, etc. are stripped for repairs and painting, which may have to be farmed out to a panel beater who can handle the correct enamelling procedures. The work is going on, but it will be a very demanding job. “Tozer KM (ETF Adel) Aus S/Car TT” means that the import/export agent was Tozer, Kemsley and Millbourn Ltd. in the UK, and that the bike was destined for the Adelaide Norton agent of the day, E. T. Fisher and Co. Ltd, 65 Grote Street, Adelaide. Thanks for the info. I had got as far as an indication the TKM were forwarding agents, but still not too sure of all that entails. Whats it doing now? Got it running? Sadly it is a long step from running. Everything I look at shows evidence of a hard life. I will try and write this up in more detail later.